As loyal followers of our VMworld blog, we wanted to let you know that we're moving to another blog platforms. To access the latest and greatest news related to VMworld, please visit blogs.vmware.com/vmworld. Don’t forget to bookmark this new site and subscribe to the blog feed in order to receive real-time updates regarding VMworld 2015. This blog will remain available through the end of VMworld US. After this time, all of our latest posts will be available at our new location. Don’t miss your opportunity to help influence the content at VMworld 2015. Public Session Voting is now open, and you can vote for your favorite session proposals to help decide what content makes it into our final agenda. Session voting ends on May 26 at 11:59 pm PDT so be sure to select your favorites soon! Voting is open to anyone-- you will be required to login to your vmworld.com account to participate. If you do not have a vmworld.com account, you can set one up for free. Your vote, and the votes of others who participate in public Session Voting, will be reviewed by our VMware Content Team and will influence the final session selection. Now get voting! Great news! VMworld 2015 US registration is now open. A year’s worth of learning in just 4 days—Plus announcements, amazing keynotes, hands-on training, and more? That’s right—this is the year to be at VMworld. Join us in San Francisco this August 30 – September 3, and connect with the people and partners who are transforming IT. This year we celebrate innovation, focusing on real solutions and showcasing some jaw-dropping new technologies. From the data center to the device, VMworld 2015 promises to deliver the essential tools and training you need to rock virtualization and the cloud. Register now to save $300 with Early Bird Pricing. Your full-conference pass gives you access to 350+ sessions and hands-on labs covering the latest in virtualization innovations. We’ve got hard-hitting content on data centers, storage, networking, security, management, mobility, hybrid cloud services, and more. Need help convincing your boss to send you to VMworld? We can virtually guarantee it’ll yield an incredible return on your investment... Download our justification letter for help demonstrating why you can’t afford to miss it. We look forward to seeing you at VMworld 2015! Register now to reserve your spot. The countdown is on! 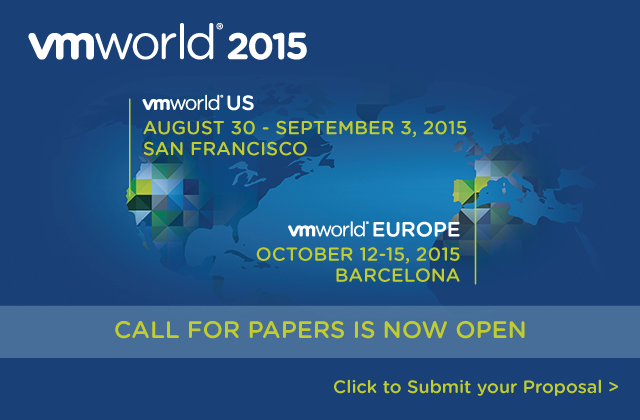 The VMworld Call for Papers submission window closes on April 28, 2015, so it’s time to put the final touches on your abstract and mark your submissions complete. Please be mindful that late submissions will not be accepted so be sure to submit on time! Read the submission guidelines carefully; these guidelines will help you craft your titles and abstracts, and avoid common reasons for rejection. Review the suggested content areas for submission; these areas offer a little guidance as you choose a focus for your abstracts. Have someone else read your title and abstract before submission, to ensure it is clear, concise and error free. Submit your title and abstract via the Call for Papers submission link. Notification letters will go out in June. Good luck to everyone submitting this year! Calling all vocal VMware veterans… Have you integrated VMware solutions and technologies in an innovative or unconventional way? Do you have a compelling case study to share with VMware customers? If so, the Call for Papers is now open and we invite you to share your submission with the greater VMware community! Before you begin, please review our Abstract Submission Guidelines for tips on preparing your titles and descriptions; this will help you avoid common pitfalls that lead to abstract rejections. And the competition is stiff, so do please be thoughtful and thorough when crafting your proposal. When ready, submit your VMworld 2015 session abstract here. All proposals must be submitted by April 28, 2015. Sorry, no exceptions. If your session is chosen, you’ll earn our gratitude, respect from your peers, and a discounted or free conference pass. Not sure where to start? Browse these key areas of the 2015 agenda. Best of luck—We’re looking forward to hearing from you! Follow our video crew for the week in Barcelona for VMworld 2014 Europe highlights. Watch the kickoff video below -- then follow the entire series from Barcelona on our VMworld TV channel on YouTube. And for more VMworld Conference video coverage, including Tech Talks and Keynotes/Sessions, visit our VMworld Videos page. Hola Barcelona! We have a great show planned for our attendees this year and we wanted take a few minutes out to call out some highlights. In preparation for VMworld Europe in Barcelona, we’ve updated the VMworld 2014 Hands-on Labs Guide. This updated edition includes all the new content created just for this event. If you are not familiar with the guide, it will help you get the most out of your lab session by listing out the labs that will be available during VMworld, broken down by Software Defined Datacenter, Mobility, Hybrid Cloud and Partner Labs. Under each lab, we have also listed the individual Lab Modules, with the estimated time to complete, whether the Module is Beginning or Advanced content, and if it is a Feature or Use-case type Module. HOL-SDC-1401 – Cloud Management with vRealize Operations This lab has been completely re-written and updated to showcase the vRealize Suite and offers a preview of vRealize Operations Manager 6. HOL-SDC-1420 – OpenStack with VMware vSphere and NSX This lab now includes two new Modules, one focusing on Python APIs and another on an Introduction to VMware Integrated OpenStack. HOL-SDC-1421 – Brokering IT Services and Applications with vCloud Automation Center A What’s New with vCAC v6.1, App Services v6.1 and ITBM Standard v1.1 Module has been added. HOL-MBL-1453 – VMware workspace Portal – Explore and Deploy A new Module has been added showing how to upgrade from Horizon Workspace v1.8 to v2.1. HOL-MBL-1454 – Applied ThinApp with Horizon Suite A new Module has been added to highlight What’s New with ThinApp v5.1. In San Francisco the Hands-on Labs teamed up with the VMware CloudCred group to make taking labs more fun and rewarding. Attendees at VMworld Europe in Barcelona have the same opportunity to win cool prizes! If you are not familiar with CloudCred, it is a way to build your cloud expertise, broaden your professional network and earn rewards at the same time. You earn points by performing tasks that help show off your cloud skills and bring you up to speed on things you may not be familiar with. You can then turn those points into rewards, like CloudCred merchandise, a 3D printer or other electronic gadgets. CloudCred runs year round, but the team is creating special tasks just for this year’s Hands-on Labs at VMworld. The CloudCred team has created a ‘World’ just for the Hands-on Labs, including our own leader-board. We will give away prizes every day to the top lab takers. You can find the leaderboard throughout the conference on the information monitors and in the Hands-on Labs. While you may not be at the top of the leaderboard, you will still have an opportunity to win! Each day we will randomly select users in the lab to receive prizes. Expert-led Workshops are back at VMworld Europe. This year, we will have 14 Expert-led Workshops covering a range of topics from vRealize, Virtual SAN, NSX, to Horizon 6 with View and vCloud Air. This is your opportunity to learn from the Experts as they guide you through the content. It is also a great forum to ask questions of the Experts who can offer their real world experience and make it relevant to your environment. These 90-minute Workshops are not scheduled in advance. We will seat the first 20 attendees in queue at the lab start time. Based on what we saw at VMworld US in San Francisco, we recommend that you arrive 30 minutes prior to the start of the Workshop. You have already seen the new content we have added just for VMworld Europe. Please drop by Hall 7 any time the labs are open and take any one of the labs we have to offer. No scheduling needed! We will also have a Hands-on Labs HotSpot located near the Registration Desk in Hall 8. Besides the labs that include content around VMware solutions, we also are offering 11 labs created by our valued Partners. Don’t let the name Partner Labs fool you! These labs were created by Partners, but are available for everyone to take. These are labs developed by our Partners to showcase their solutions and seamless integration with VMware technology. These labs are great for experiencing how well our Partner’s products integrate with VMware and enhance the overall solution. We cannot wait to meet you at the VMware Hands-on Labs at VMworld Europe in Hall 7! Complete this survey for the opportunity to be a part of the limited group of 30 attendees to participate in the EVO: RAIL Challenge. If selected, you’ll be given the chance to compete in a race against time to build an EVO:RAIL Appliance. The two challenge participants with the overall best times will compete in the Final Challenge, which will take place on Thursday, 16 October at 12:00 in the Hang Space, Hall 7.0. 1st Prize is a VMworld 2015 Conference Pass. Pass valid for VMworld 2015 US or Europe Conference Pass only, all travel, hotel and all other expenses are the responsibility of the winner. Next week marks the European edition of VMworld 2014. Over the past 10 days, we have seen a drastic change in the number of registrations from across different countries. This week, Spain has joined the list of top 10 nations with the most attendees and Russia came close in 11th place. In addition, there have been new registrants from Albania, Andorra, Guadeloupe, Hong Kong and Malaysia. Finally, we will have some special guests joining us from Scotland to perform at the Customer Appreciate party - Simple Minds! See more details on Wednesday's party on the Networking page. ¡Tiempo para el VMworld 2014 Europe de nuevo en Barcelona! We're excited to bring the VMworld community together again in Barcelona -- such a great venue for an impactful global event. As a guide for social media resources, please share this blog post with other attendees or online followers of the conference. The vBrownBag production team will be running a series of 30 minute LIVE presentations Tues and Wed in the Hang Space on stage for audience viewing. These will also be filmed for watching as a LIVE stream or recordings. Please read the Tech Talks blog post for the schedule of speakers and topics. Drop by to see the latest VMworld topics and trends buzzing on social channels and say hi to our team. Ask about best practices, tips or questions on social media content at VMworld. And if you have content of value to share with the VMworld community, ask about amplification and/or retweets. Drop by and meet with a community manager to learn more about VMware Discussion Forums & Communities (VMTN), our Product Beta Program, our vExpert Program or any of our specific Communities for Developers, Support, Training, Certification, TAM and more. Hands-on Labs and CloudCred are teaming up at VMworld to reward you for doing something you already love doing -- taking Labs! By signing up for CloudCred and completing Labs, you will have the opportunity to win prizes such as a GoPro or iPod. Drop by the CloudCred station to learn more or pick up prizes. Read http://vmw.re/hol-cloudcred. If you are a blogger and contributing with VMworld related blogs during the conference, join fellow bloggers at our dedicated Blogger table (with internet connections and power charging). Ask for a VMworld Blogger button/pin. There are also blogger tables available at the front of General Session. Sign-up to be added to our "unofficial list of VMworld Bloggers" for networking and stay current with all blog rollups: http://vmw.re/bloggers. We will have 3 jumbo big screens in the Hang Space for viewing realtime social media streams of posts and photos from Twitter, Facebook and Instagram. Highlight loops will display conference info, lab stats, leaderboards and highlights. General Sessions will be broadcast on screens Tues and Wed morning. There will be a new VMworld 2014 Mobile App for Europe (available soon, separate from the U.S. version). Download this from either the iOS or Android app store. Under "Social Media" you will find a realtime stream and social media links. Session abstracts with session hashtags, sponsor/exhibitor info and your own tweets and photos can be shared directly from the mobile app. Visit http://vmw.re/mobile. And if you need even more to fill your schedules, make room for parties and other gatherings during the week. See a growing list of official/unofficial gatherings at http://vmw.re/gatherings. NEW this year, is an online realtime social stream of Twitter, Facebook and Instagram to follow VMworld postings and buzz. Watch this stream leading into, during and after the conference. Online at http://vmw.re/social-stream. Watch General Session keynotes, VMworld TV interviews & highlights, Community Tech Talks and other VMworld videos all in one place. Both LIVE streams and recordings will be availalble: http://vmw.re/videos. For a listing of all VMworld channels to follow and subscribe to, visit http://vmw.re/social. Photos are one of the best ways to experience VMworld online. Search Twitter, Facebook, Instagram, Flickr and other networks for the #VMworld or #VMworldSelfie hashtags. You can also visit http://vmw.re/photos for links to our albums. Join VMUG at VMworld Europe! The VMUG booth will be #S213 - we hope to see you there! The VMUG Booth is the place to meet VMUG Board members, Leaders, and your fellow members. We encourage you to use the VMUG Booth as a meeting place – feel free to hang out, get the latest VMUG information and win some great giveaways! Stop by registration on Monday, October 13th between 13:00 – 17:00 or Tuesday, October 14th before the general session to pick up your VMUG t-shirt. Wear your t-shirt on Wednesday, October 15th to show the strength of the VMUG community! VMUG will be holding a member party on Monday, October 13th sponsored by VMware. Check out the VMUG VMworld page to RSVP for the party. Join us at the VMUG booth to learn more about all of the discounts on training, software and more! VMworld attendees will receive a special discount when you purchase on-site. Show Us How You VMUG! Join in #ShareVMUG and post your pictures leading up to and at VMworld. As the demand for IT professionals with virtualization and cloud skills increases, it becomes more and more essential to distinguish yourself in the market. VMware’s industry-recognized certifications validate your technical capabilities and knowledge, giving you an edge. At the VMworld Certification Exam Center all VMware Certified Professional (VCP) and VMware Certified Advanced Professional (VCAP) exams will be 50% off the regular price. This is an excellent opportunity to recertify your certification or validate new skills at a significant savings. While you’re in Barcelona, make sure you stop by the Education and Certification Lounge in Hall 7. We’ll have last minute study materials available, answer any questions you may have about recertification, and can even get you registered for an exam onsite. Follow @VMwareEducation on Twitter for the latest updates! Continuing to track the international representation in registration: here's this week's update on attendance! With only 20 days left until VMworld 2014 Europe, Norway, France and Italy have jumped up the rankings with registrations from Italy doubling over the last 10 days. In addition, we have seen new registrants for the first time this year from Senegal and South Korea. Follow these channels for regional updates: Spain, United Kingdom, Russia, France, Germany, Belgium, Netherlands, Italy, Latin America, APJ, Japan, Australia, Singapore, Israel, Middle East, and South Africa. A couple of days ago I had a discussion with someone. That person asked me why I felt people should attend VMworld Europe. I didn’t have to think too long, to me the European event has always been special. I know some may have a different opinion, but I personally always liked the European event and there are a couple of simple reasons for it. So let me explain why I feel that the European event is worth attending. Networking is of course useful anywhere, but what are you truly going to get out of a US based event when all of your business is in Europe? On top of that, typically the event feels less crowded and I have noticed people are a bit more laid back because of that which makes it easier to have random conversations. I find myself just sitting down during lunch with random people and chatting away with people from various countries. It is always interesting to find out if technology adoption is different, what the trends are etc. Some countries in Europe are a couple of steps ahead when it comes to deploying certain solutions, these make very interesting conversations. VMworld is not just about networking of course, it is also very much about gaining knowledge. When I went to VMworld as an attendee I would fill my agenda up with deepdives and the one thing I noticed is that for Europe it was always easier to get in to sessions and especially the ones covering new features or products. On top of that, you have probably seen all the buzz from VMworld US which means that you can now pick that one session everyone was raving about! And of course I should not forget the VMworld labs. As just stated, by now you have all digested the product announcements and know what you want to learn more about… so you can go and take that Lab you wanted to take. Of course you can also do this online, but at VMworld you have experts walking around who can provide help and answer questions whenever you have them. Great right? Last but not least: Barcelona. Don’t get me wrong, San Francisco is a great city… But so is Barcelona. The cultural and historical richness of it makes it worth visiting, and if I have to give one tip: Basílica de la Sagrada Família. Also, there are some great restaurants there, so if you enjoy good food it is a great place. To summarize: Register now, and don’t miss out! Duncan is a Chief Technologist on VMware’s Emerging Solutions R&D team. He has written numerous industry publications and books and is the owner of Yellow-Bricks.com, the #1 ranked virtualization blog in vSphere-Land.com’s annual top 25 list. Register now for VMworld 2014 Europe, 13-16 October 2014. Sign up for sessions, hands on labs and group discussions using the Schedule Builder. Learn how to connect at the conference and online today. Write your own blog? Get added to the VMworld Blogger List. Have you heard of Eurovision? The annual song contest is based on each European country selecting one musical group to represent their nation, then the winners are chosen by popular vote. Much like Eurovision, VMworld brings together 92 different nationalities to share their newest endeavors (in technology and sometimes air guitar abilities). Based on the idea of attendee diversity and some friendly competition, we thought it would be interesting to rank the top 10 European countries represented at VMworld 2014 Europe in Barcelona, Spain. We found it interesting to compare last year’s attendance to see any changes. This year the top 5 countries by percentage include: UK (15.13%), Germany (13.35%), Netherlands (6.77%), Switzerland (4.55%) and Sweden (4.23%). The rankings were fairly different in 2013, when the top 5 countries by percentage were: UK (13.79%), Germany (11.78%), Netherlands (6.24%), Spain (6.10%) and France (5.90%), followed by Sweden, Italy, Norway, Switzerland and Russia. Some new countries this year in attendance include: Aland Islands, Armenia, New Caledonia, and Reunion Island. Hope you enjoyed these statistics and will follow along as we continue to track the top 10 countries attending VMworld 2014 Europe. Excited to meet all attendees in less than 30 days in Barcelona! Try these sites for more information on the 3-day agenda, travel, training, networking and sessions or hands-on labs. Check out the "Official" Music Video from VMworld 2013 Europe! NEW! Watch video recordings of the Top 10 Sessions for Monday, Tuesday and Wednesday from VMworld 2014 U.S. (available for everyone). Scroll through the pages for top 10 from all 3 days. For all sessions, you must be a paid VMworld 2014 U.S. attendee. Attendees will be notified when available in early September. Watch for variety of offerings from our VMworld Social Media & Community page as we head into VMworld 2014 Europe. For example, the VMworld team curated a series of community postings into a VMworld Storify account. We will also be posting VMworld 2014 photo albums on Facebook, Flickr, Instagram, Pinterest. NEW this year, we are offering a VMworld 2014 Social Stream of postings and photos from Twitter, Facebook and Instagram, directly from you, our community. Watch this stream and participate by adding the #vmworld hashtag to any of your postings to appear in the stream. This will be running for all of VMworld 2014 — from San Francisco through to Barcelona!. Speaking of events - what do you hope to see at the Welcome Reception and Hall Crawl? follow Twitter @VMware_Partners for more information! The VMworld Hang Space is a huge open-space room next to the General Session auditorium in lower Moscone North (just below the escalators). Whether new to VMworld, or experienced alumni, plan to spend time here networking with bloggers, subject experts, co-workers and VMworld attendees. It's the perfect place to meet-up, get organized, catch up on news & email, write blogs, browse social media streams, charge devices, or just relax. Our Community Theater, hosted by vBrownBag, will offer brief technical presentations, demos and discussions with audience seating. The Tech Talks will be streamed LIVE for viewing online and made available as recordings for viewing later. View the schedule of Tech Talks with details on time/presenter. Be sure to thank the vBrownBag crew for what a great job they do, because they put in a lot of effort to host talks just for you. If you can't stop by, watch online. There will be a dedicated Blogger table with seating for ~20 bloggers, equipped with high-speed internet connections and power strips. This is an excellent location to meet fellow bloggers and vExperts to talk about the conference or make connections face-to-face. There will also be dedicated blogger tables at the front of the General Session auditorium. To increase awareness and exposure of bloggers, please visit our VMworld Bloggers page and sign-up for our Blogger list for listing and inclusion in the VMworld blog rollup. Drop by this fantastic resource to meet actual VMware Community Managers from our VMTN Forums, vExpert Program, Beta Programs, VMware Social Support team, VMware Education and Certification team, TAM Program and VMUG User Groups. These Community Managers, many you may recognize from their Social Media accounts, can provide demos and answer questions on programs, events, support, and social media & community offerings. Attached to the VMware Communities Booth, you will find CloudCred, which is offering a special alliance with Hands-on-Labs this year. Whenever you complete a Hands-on-Lab, you will be given a verification code for CloudCred which will give you the opportunity to win awesome prizes. Drop by this CloudCred booth to learn more about the cool alliance and to join the CloudCred community if you haven't already. Read the recent CloudCred-HOL blog post. Located between the Community Tech Talks and VMware Communities Booth, the Social Media Command Center is where the pulse of VMworld Social Media will monitored and amplified. Drop by and talk to our Social Media team about tips and tricks for social media at VMworld. We always love to talk to our community about insights and opportunities to increase reach and amplification while monitoring the buzz of the show. For an overall listing of social media offerings, visit our VMworld Social Media & Community page. A favorite every year, we will have 3 jumbo screens spread across the Hang Space to view social media streams, conference highlights and live/recorded video throughout the week. Share your own Tweets, Facebook posts and Instagram photos using #VMworld hashtags to see yourself included on the big screen realtime social media streams. Theses same screens will be showing LIVE streams of General Sessions on Monday and Tuesday morning, so consider watching from in the Hang Space to avoid the General Session auditorium crowd. There will be several other highlights of the Hang Space that will make it a highlight of the show for all attendees. Be sure to schedule time to "hang out" here and either network or relax. And don't forget to download the VMworld 2014 Mobile App. We are very excited about another great Hands-on Labs at VMworld and happy to give you an inside peek at what is coming. Why attend Hands-on Labs during VMworld ? #1. Be the first to take the latest Hands-on Labs. Our labs are released every year at VMworld US. The labs feature the latest products, features and solutions from VMware and partners. #2. Interact with over 225 VMware product experts under one roof. Our experts are ready to provide guidance, share best practices when using our products. This is probably the only place in the universe where you can get access to this many product experts under one roof. #3. Interact with your peers, and colleagues. This year we are featuring “Focus Areas” where like-minded individuals can take the same lab and share their experiences in a very casual and interactive manner. Attendees taking Hands-on Labs during VMworld will get points for taking labs. This is a great way to gain an upper edge on your peers and have fun taking Hands-on Labs. We have over 225 Product Experts under one roof to answer your product questions. We are extremely proud of our new Hands-on Lab content for 2014. We have taken the best from last year and improved upon it based on your feedback and comments. This year we are showcasing labs like Airwatch that will have outbound access to your device. This means you will be able to get an up close and personal look at how to manage mobile devices using Airwatch Management platform. NSX Partner Solutions – we are featuring labs show casing integration with leading partners such as Palo Alto Networks, Juniper and Symantec. The NSX was the number one lab around the world last year and destined to continue to be in the top ranking this year. Be the first to test out our new labs. The world around storage – We have great new modulus dedicated to storage and storage performance monitoring. This is a great opportunity to get ahead on Virtual SAN technology. We have a great deal of new content so be sure to check out our Hands-on Labs catalog. This year we are featuring some top solutions created by our Partners who we incorporated as part of our development teams. We are very product of our solutions and hope you have time to take our Partner Hands-on Labs. Please take a look at our complete Hands-on Lab catalog for VMworld 2014. The Expert Led Workshops provide an intimate experience with you and our product experts. The workshops are small by design and geared for you to take a lab, learn best practices and tips from the product Experts. You will follow along the Hands-on Lab and more important hear from the Experts on the tips and tricks when using our products. The Expert Led Workshops are scheduled through the Schedule Builder – they have filled up fast. The Hands-on Lab we have known over the years. We are offering Traditional seating with desktops sponsored by Dell. These include the Dell Z90 and D90 Thin Clients and the beautiful 24” Monitors. We are also offering the ability for you to bring your own laptop to take a lab. If you do decide to take the lab using your laptop you will need the latest versions of Firefox, Chrome, Safari and Internet Explorer (10+) Please be sure to check the Lab hours – You do not need to register to take a Self Paced Hands-on Lab – just show up. As we mentioned above these areas are dedicated for you to come in with your like-minded individuals, take a lab and share experiences. We will have Product Experts in the area to help with any questions if they come up. We are planning on having 1 Hot Spot in Moscone West for users that would like to take a Lab in between sessions and breaks. We will have the area supported with product experts who can help you with product questions. Its seems like just yesterday we were getting by with one datacenter but as demand has increased we have started building out global capacity to meet the needs of our global user base. Hands-On Labs wants to hear from you! This year at VMworld, the Hands-On Labs will feature a Feedback Corner where you can drop in to let them know what’s on your mind. They want to talk to customers, partners, consultants, and virtualization enthusiasts from all industries. Help HOL improve the customer experience by participating in a usability test. They are looking for feedback about a range of products and ideas. Throughout the week they will also be interviewing virtualization rockstars. Stop by to see who is on our interview couch, give your feedback, and fill out a survey to be entered for raffle prizes. They are giving away GoPro Cameras, Bose speakers, Beats Pills, and a swarm of Hadoop elephants. Women of Purpose is a community that promotes, elevates and connects women within VMware, customers, partners and employees. We were founded in 2010 and are thrilled to host our 5th annual Women of Purpose at VMworld 2014. We have an exciting agenda for Women of Purpose with a featured industry speaker, a women executive panel and networking exercise. In addition, there we will be hosting a reception post-event to continue the conversation. VMworld attendees can register today to join us on Tuesday, August 26th from 4-6PM (VMworld pass and badge are required to attend this event). Please connect to Women of Purpose Group on LinkedIn. Personal Branding is about identifying and communicating what makes you unique and relevant to your target audience, so that you can reach your career and/or business goals. The idea is that if you understand your strengths, skills, passions, and values, you can use this information to separate yourself from others and really stand out. For women, creating and promoting an authentic personal brand can be a difficult task to accomplish. Research shows that some women have trouble with this because self-promotion is not part of their upbringing as women. The Women of Purpose event at VMworld hopes to bring awareness to and help women create their own personal brand. In 2014 VMware launched VMwomen, an enterprise-wide initiative to increase the representation of women. It builds on research showing how greater diversity results in increased innovation, which in turn leads to better business outcomes. VMwomen is led by VMware CEO, Pat Gelsinger, and holds each business leader accountable for a measurable plan to increase representation in hiring, promotions and retention within their organization. Women of Purpose is a customer, partner and VMware employee program within the VMwomen initiative. If you are planning your schedule of sessions and labs for VMworld 2014, you are among hundreds or thousands of other attendees doing the same. As you login to Schedule Builder and start building your schedule, or browse through Content Catalog, be sure to take the time to research the session details, speaker info, and time/location. NOTE: Remember to leave enough time between sessions to walk or travel between locations. There are a few 2014 session preview videos posted on VMworld TV (look for more later). There are also dozens of session video recordings (2013, 2012, etc.) posted on VMworld TV to help get a sense of what the breakout sessions are like. Be sure to Subscribe to VMworld TV to stay informed of the latest uploads, especially the new 2014 top sessions. Most of VMworld 2013 breakout sessions (recordings and resources available) can now be accessed and viewed at VMworld Online Sessions (2013 back to 2004) without an attendee subscription, by logging in with your vmworld.com account. NOTE: VMworld 2014 Sessions will be made available online to all paid attendees (only) following the conference. Another great resource available is our VMworld SlideShare channel. Here you can browse or search for the presentation slides from all VMworld 2013 breakout sessions. These are great for reviewing sessions online or offline when deciding what to attend in 2014. Be sure to Follow our SlideShare channel to stay informed of new slides posted for 2014 sessions. Please take the surveys onsite or by mobile device to help us with feedback and improving the overall experience and offerings. We hope eveyone has a great session and lab experience at VMworld 2014 this year! BlogVMware.com is blog specializing in Virtualization Technology & Cloud Computing. Awarded a blogger pass to VMworld Barcelona 2014/2013 for second year consecutive. Ranking 123 & TOP 25 of New Virtualization Blogs 2014 on vsphere-land.com, covering all aspects VMware vSphere. Come to VMworld US early and take advantage of these pre-conference training courses at 25% off the regular price. These special course offerings are your chance to hone your skills on the latest VMware technologies and solutions. New this year! Some of these classes will offer “hybrid” delivery which gives you the option to attend in person or live online remotely. This gives you the ability to fully participate in class without requiring additional travel days. Space is limited, so register today. Registration for these classes is handled via VMworld registration. When you register for the conference you will be given the opportunity to add a training class. Select the class and location you are interested in, and complete your event registration. This course focuses on installing, configuring, and managing VMware vCloud® Automation Center™. This course covers the configuration and use of the vCloud Automation Center platform, including self-service provisioning and the creation of multivendor cloud services. This comprehensive, fast-paced course focuses on installing, configuring, and managing VMware NSX™. NSX is a software networking and security virtualization platform that delivers the operational model of a virtual machine for the network. Virtual networks reproduce the layer 2–layer 7 network model in software, enabling complex multitier network topologies to be created and provisioned programmatically in seconds. NSX also provides a new model for network security where security profiles are distributed to and enforced by virtual ports and move with virtual machines. This course focuses on deploying and managing a software-defined storage solution with VMware® Virtual SAN™ 5.5. This course looks at how Virtual SAN is used as an important component in the VMware® software-defined data center. The course is based on VMware® ESXi™ 5.5 and VMware® vCenter Server™ 5.5. At the VMworld Certification Exam Center all VMware Certified Professional (VCP) and VMware Certified Advanced Professional (VCAP) exams will be 50% off the regular price (save up to $200). This is an excellent opportunity to recertify your certification or validate new skills at a significant savings. To get tips and stay connected, follow the VMware Education Blog, Facebook and Twitter. VMUG will be hosting a number of fun activities while at VMworld and we want to see you there! You can start by picking up your free VMUG shirt at registration from 1:00 p.m. – 5:00 p.m. on Sunday. We are asking all VMUG members to wear their green shirts on Tuesday for the VMUG Green Out. Be spotted in a green VMUG shirt on Tuesday and you could win! The VMUG Booth in the Solutions Exchange will be our base of operations for the week. Stop by and see us at the booth to get the latest VMUG information, win some great giveaways, and post your picture on our member wall! You’ll have a chance to win an Alienware 14 gaming laptop by picking up a card at the VMUG and Global Knowledge Booth (#534). The VMUG Booth is also the place to meet the VMUG Board of Directors, Leaders, and your fellow members. We encourage you to use the VMUG Booth as a meeting place – feel free to hang out! Join in the VMUG 5 Week Challenge! Starting on July 21st, VMUG will post a new challenge on Twitter every Monday at 10:00 a.m. CST. Complete the challenge each week, and you’ll be enter to win one of four VMunderground passes, a VMworld party you won’t want to miss! Calling all current subscribers: Stop by the VMUG booth to win some great prizes and pick up your complimentary VMUG Advantage shirt! For the latest updates on VMUG’s activities at VMworld, visit our VMUG at VMworld page and follow us on Twitter @MyVMUG. It's that season again... not summer or fall, but VMworld! Bigger than ever, the theme says it all — NO LIMITS. With so many online conversations, so many social postings, so many community gatherings, social media and community has arguably become the heartbeat for much of VMworld. If you are planning to attend, welcome to one of the greatest networking events in the IT industry. If you go through the week at VMworld without exhausting all your networking opportunities, you may be missing the biggest takeaway of the conference. Take advantage of every moment, from discussions with session & theater speakers — to demos with booth staff — to hallway conversations with other attendees. Don't be afraid to tap the shoulder of that person standing or sitting next to you and introduce yourself. Use VMword social media conversations to amplify your networking with the extended VMworld community. NOTE: if you are attending and haven’t done so already, be sure to add your Twitter @name in the VMworld registration form. This is an opt-in option for printing this on your badge. The Hang Space, a huge open-space room next to the General Session theater, will be a destination for many attendees who share a passion for social media. Plan to spend time at the Hang Space to network with bloggers, subject experts, executives and VMworld Attendees. It's the perfect place to meet-up, get organized, catch up on news & email, blog, charge devices, or just relax with lounge seating, interactive games and beverages. The Solutions Exchange offers fast-paced networking at the Sponsor & Exhibitor booths. Plan to spend time with company reps, watching demos, listening to theater presentations and meeting hundreds of attendees exploring this area. Don't forget to bring business cards or contact apps, as well as your backpack or swag bag to collect materials and goodies. Explore the various Lounges around the VMworld venue — from the Partner Lounge — to Advocacy Lounge — to Certification Lounge — to Alumni Lounge. Each of these lounges offers a unique networking experience based on different audiences. Check the Conference maps for exact location of each. For a summary of all offerings, visit our VMworld Social Media & Community page or download the Social Media Guide . Please share this with your peers. We highly recommend all attendees download and use the Mobile App this year. It has been refreshed for 2014 and integrated with social media, session and schedule info (with hashtags to tweet about specific sessions), daily agenda highlights and even a mobile game for attendees with leaderboard. The mobile app will be available for download for both iOS and Android devices from Mobile App Stores. (mid-Aug for U.S. and Oct for Europe). The official VMworld conference hashtag is #vmworld. We are also encouraging fun hashtags such as #vmworld3word (your best 3-word tweet) and #vmworldselfie (for selfies and group pics). Hashtags are also available for every Session & Lab by making a hashtag out of any SessionID or LabID (remove all dashes). For more details on hashtags and to view realtime VMworld Twitter streams, visit VMworld Twitter Hashtags. Post VMworld discussions, reply to threads, share Q&A or upload documents for the community at our VMworld Discussion Forum. This is a great place to connect with other attendees, browse topics or reach out to the Event staff. If you prefer Twitter, use the VMworld hashtags listed above to view conversations, network and post your tweets. Blogger tables will be setup in the Hang Space and at the front of the General Session theater for use by VMworld bloggers. Blogger buttons will be available at the Hang Space tables and an unofficial Blogger list is available online along with a rollup of blog posts from contributing bloggers. View and signup at VMworld Bloggers. At the Hang Space, there will be a Community Tech Talks stage with LIVE streaming video for sessions throughout the week. In the lobby of Moscone South, theCUBE, hosted by SiliconAngle and Wikibon, will be LIVE streaming interviews with executives, tech influencers and analysts. And roaming the conference hallways will be our own VMworld TV crew, providing conference highlights and interviews. Watch it all online and learn about schedules and signup at VMworld Videos. If you plan to take photos at VMworld, please tag them with #vmworld or #vmworldselfie and share them on Twitter, Facebook and Instagram. For any videos you create, please upload them to YouTube, Vimeo or try short video loops using Vine App and Instagram. Plan time in your schedules for both official and unofficial conference events, community gatherings and sponsor parties — happening all week, night and day. We’ve put together a VMworld Gatherings list for you – and if you have an additional gathering you wish to add, please use the submission form on this page. You’ve searched the Content Catalog, and made your list of must-attend sessions. It’s time to make it official and log in to Schedule Builder, sign up for the sessions you want to attend, and create your VMworld schedule. If you haven’t registered yet, register now for VMworld --you have to be registered to access Schedule Builder, and some sessions fill up quickly. Pre-registration is strongly suggested. VMworld offers 350 technical and content-rich sessions and labs, the ability to review 250 solutions side-by-side with sponsors and exhibitors in our Solutions Exchange, and multiple opportunities to connect and network with other IT professionals, VMware and subject matter experts. This is the year for boundless opportunities and the chance to define your VMworld experience with No Limits. Register now. Create your schedule. Get ready for a great VMworld 2014!